Extremely rare, old Marathi movie poster of the blockbuster black and white film, Sant Tukaram (1936) for sale. This is an actual surviving original old Marathi movie poster of the 1936 film which was produced by Prabhat Film Company and directed by Vishnupant Govind Damle. The film’s storyline was based on the life of Saint Tukaram, a prominent saint and spiritual poet of the Bhakti movement in India, played by Vishnupant Pagnis. Saint Tukaram was one of most revered saints of Maharashtra who played a prominent role in propagating secularism and removal of the class system. Sant Tukaram was one of the early films made in neo-realistic style. It was also the first Indian film to get a screening at an international film festival, receiving international recognition. Sant Tukaram was declared as one of the three best films of the world at the Venice Film Festival and was subsequently showcased in other international film festivals. Sant Tukaram became Prabhat Film Company’s greatest success and set the bar for devotional films in India. Most of the songs of the film were based on Saint Tukaram’s own verses. 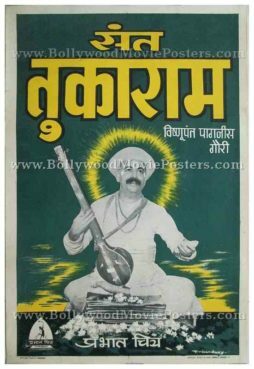 At the time it was released, Sant Tukaram was a runaway success at the box office and broke all records by becoming the first Indian film to run in a single theater for over a year, making this old Marathi movie poster, highly collectible. Such was the film’s success that it drew millions to the theater. Besides its impact at the box office, Sant Tukaram also had a spiritual effect on audiences of all age groups and ethnic backgrounds. 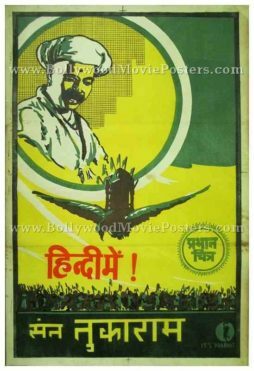 Printed and circulated a few years after the first release of the film (early 1940s) during the Hindi release of the film, this old Marathi movie poster was originally designed for publicity of the film but never ended up being used.